Eddie Redmayne attracted rather a lot of attention as he took to centre court at Queen’s sponsored by Moet and Chandon in London yesterday. But we don’t think it was his tennis talent that had people talking. The British heartthrob showed off his ball skills as he arrived for the event, and within minutes, his name was trending on Twitter. IN PICTURES: THE 16 MOST STYLISH MEN OF ALL TIME! 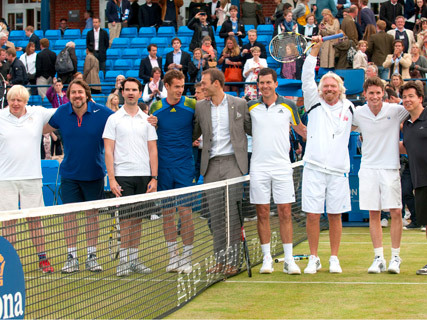 Dressed in tennis whites, the actor partnered Tim Henman for one of a series of The Rally Against Cance matches, organised by Andy Murray. ‘Undoubtedly watched the greatest game of tennis today #Queens #EddieRedmayne #gorgeous,’ one user wrote. Joining Eddie Redmayne in the tournament, were comedians Michael MacIntyre and Jimmy Carr, Virgin boss Richard Branson, and London Mayor Boris Johnson. The event was one of a series raising money for The Royal Marsden Cancer Charity, after British Davis Cup player Ross Hutchins was diagnosed with Hodgkin’s lymphoma.